A comprehensive range of Azuga DashCam solutions is now available to meet all fleet budgets. 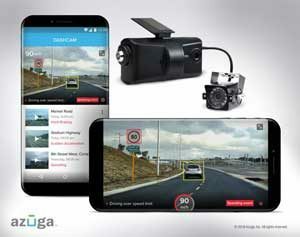 The most affordable option, Azuga DashCam Lite, uses a driver’s smartphone camera for video monitoring. For more comprehensive monitoring, Azuga offers two additional Azuga DashCam versions with standalone wireless cameras and optional advanced recording features. Azuga DashCam continuously monitors driving activity, and when triggered, automatically records up to 10 seconds of video before and after an incident is detected related to hard braking, sudden acceleration or hard cornering. These video clips are transmitted directly to the cloud, and then added to individual driver breadcrumb reports that include specific time, date, location and speed details. Videos are then analyzed and given a video risk score to help fleet managers easily determine whether drivers are at fault for incidents, and whether driver behavior modification is necessary.